ALL ENGINES AND GENERATORS AVAILABLE! REPLACEMENT PARTS FOR ALL HONDA EQUIPMENT. 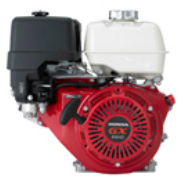 The GX160 offers improved fuel economy, lower noise levels, lower vibration, and lower emissions – without sacrificing power output or performance. And the new GX160 essentially matches the dimensions of the previous model, so no modifications to existing equipment designs are necessary.